I always feel like fall has officially begun once we’ve made our annual trip to Wilson’s Orchard in Iowa City, Iowa. 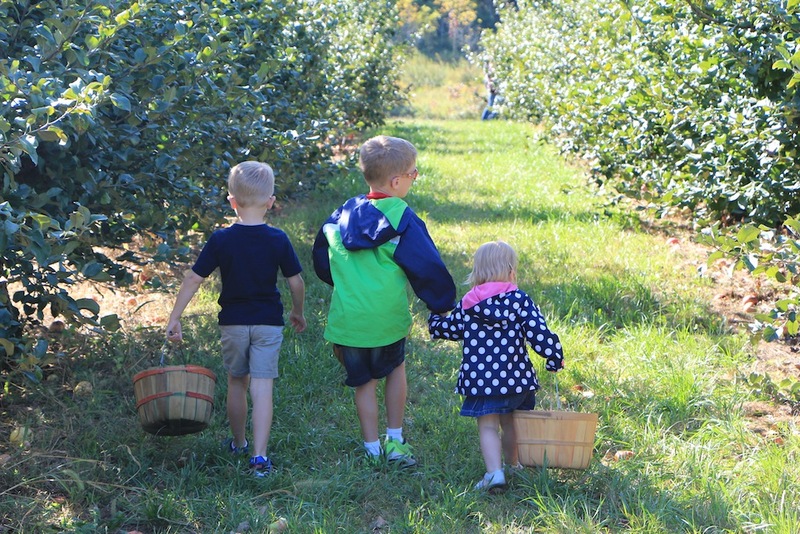 Our family loves spending the day walking amongst the trees, taking photos and of course, eating apples as we pick! Follow along with me as we go apple picking and then I’ll show you our very favorite ways to use those apples at home. 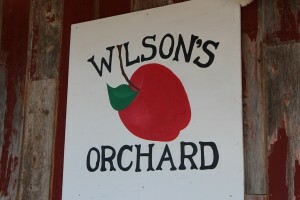 My husband and I have visited Wilson’s Orchard every year since 2001, the year we got married. 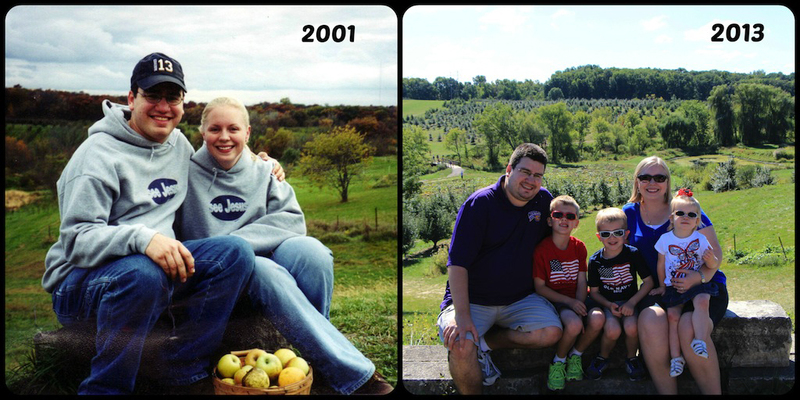 We lived in Iowa City for the first two years of our marriage and we had friends who worked at the orchard. It was a much simpler operation then, but it was a great way to spend a Saturday afternoon. We would load up our baskets with what we thought would be enough apples to last us through the winter, but inevitably, we’d run out too soon, because we couldn’t stop ourselves from snacking on them. 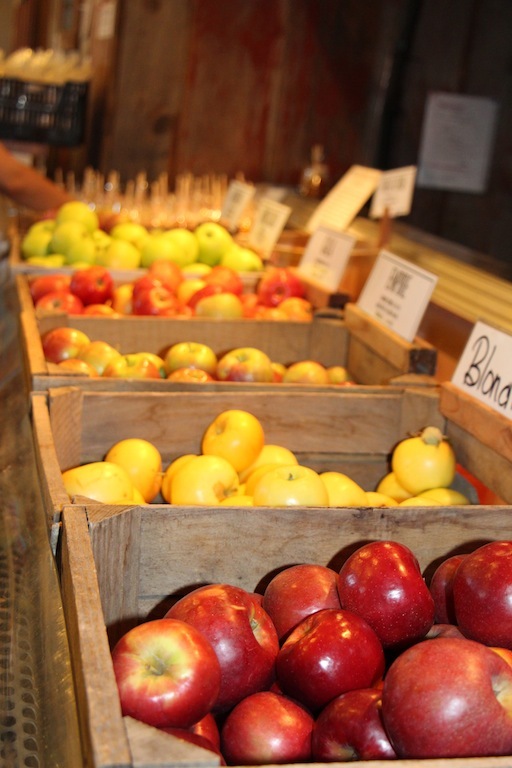 The quality of an apple straight from the orchard can’t be beat! After those couple years, we moved two hours away, but like clockwork, we still returned to Wilson’s every fall during apple-picking season. Our favorite apple varieties have changed over the years, but we’ve always loved Blushing Golden and Jonagold, and our newest favorite is Honeycrisp. Our kids look forward to our trips and I love looking back through old orchard photos to see just how much our family has changed over the years. 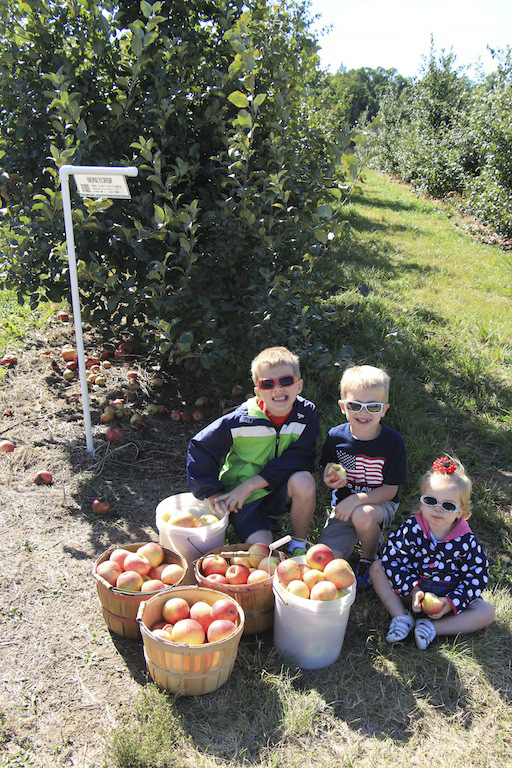 We found out that it was peak Honeycrisp season, so we loaded up the van and set off on a family road trip. The orchard opened at 10:00 and it was game day in Iowa City (those people love their Hawkeye football! ), so we thought it wouldn’t be too crowded yet if we arrived at opening. We were wrong! We pulled in at 10:17 and joined the line of cars looking for parking. 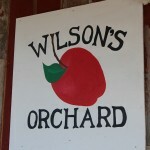 I think the public has finally discovered the hidden gem of Wilson’s Orchard. 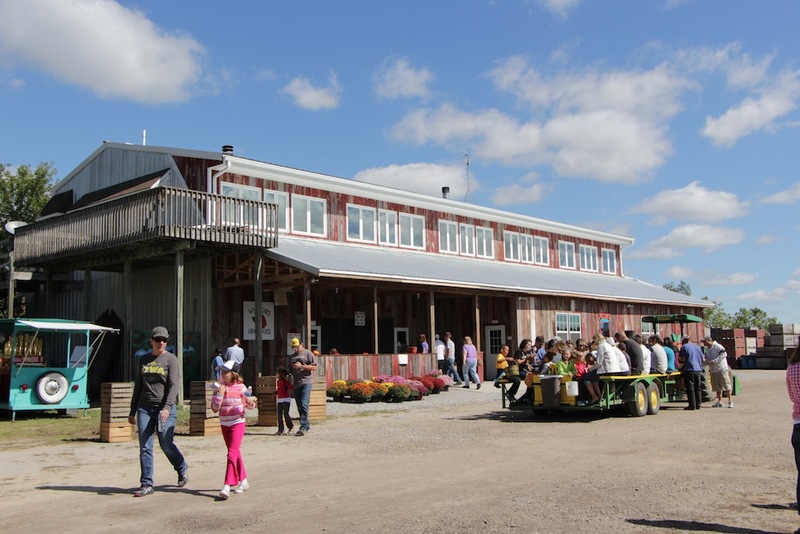 The first thing we noticed was the main store building – it was a lot bigger than last year! We went into the store to get some baskets and stopped to look around at all the offerings. Even though it was busy, it’s such a homey place. 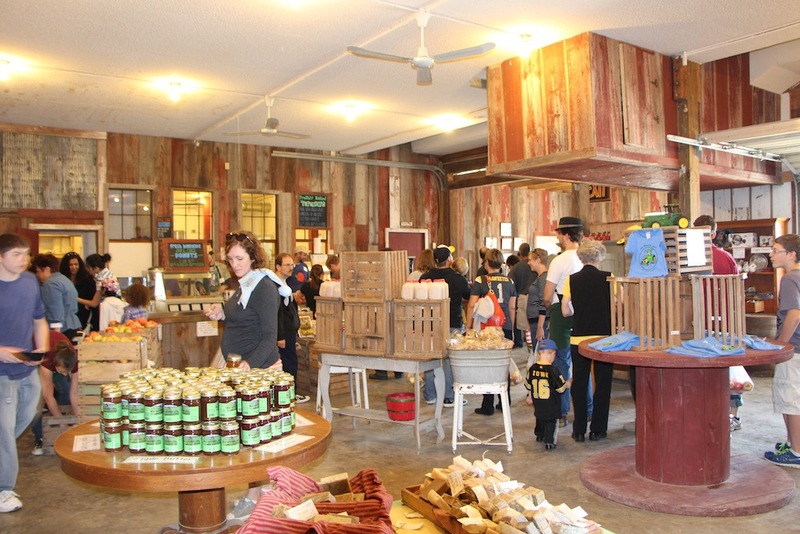 In addition to the apples for sale, you can also browse through a variety of jams and jellies, popcorn, soaps, t-shirts and fresh baked goods (more on those later!). We picked up our baskets, our kids took their yearly photos in front of the giant apple growth chart and we hopped onto the trailer for a tractor ride down into the orchard. 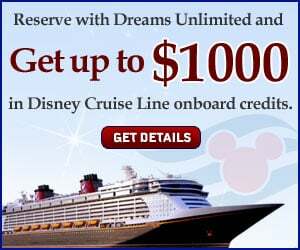 This ride is free, unlike at many orchards. The kids loved it, especially when the driver pretended to be stuck in the creek. Once we were dropped off in the Honeycrisp section, we had about half an hour until the tractor would come back around, so we set off through the trees. Our 5-year-old, Jonah, made it his mission to fill up his basket as quickly as possible. He got right in there, looking for the biggest and reddest apples he could find. He was so proud of how full he filled his basket and wouldn’t accept any help to carry it. Lydia picked a couple apples, then just ate while following us around. In total, we picked 44 pounds of apples, which, surprisingly, is not the most that we’ve ever picked. After paying for our haul, it was time to eat! 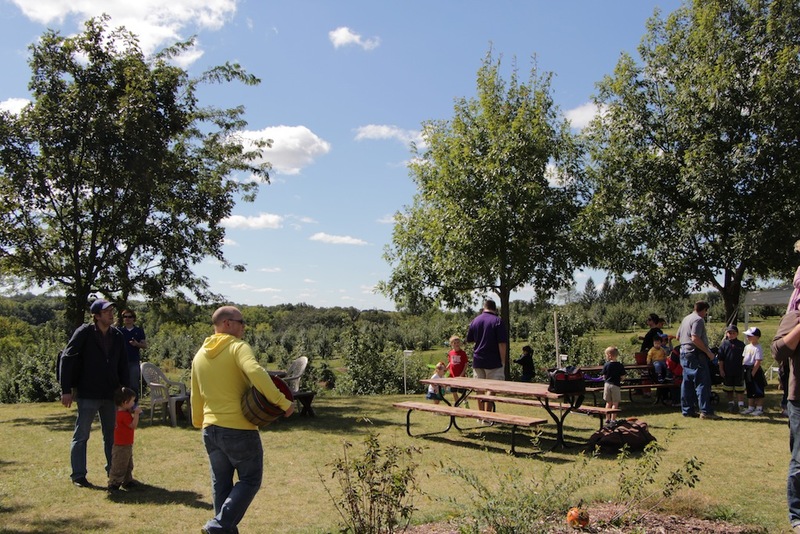 There’s a great picnic area overlooking the orchard. Wilson’s makes some amazing apple treats. Our absolute favorite is the apple turnovers. We always buy some to eat there, then we buy a dozen (or two) frozen to bring home. 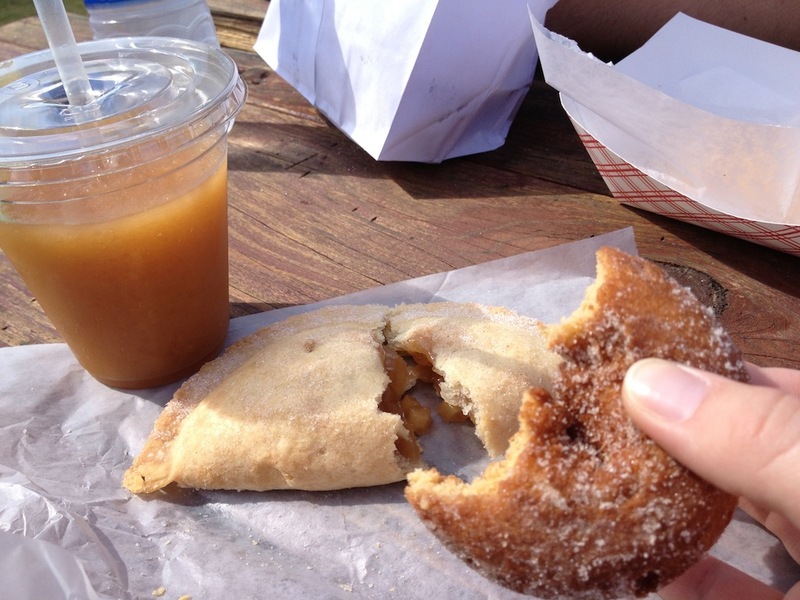 This year, we also bought two frozen apple pies, a few apple cider donuts and an apple cider slushie. Looks like a great lunch to me! I’ve already made several different treats with our apples from the orchard: German apple cake, mini apple pies, apple chips, applesauce and our favorite – apple crisp. 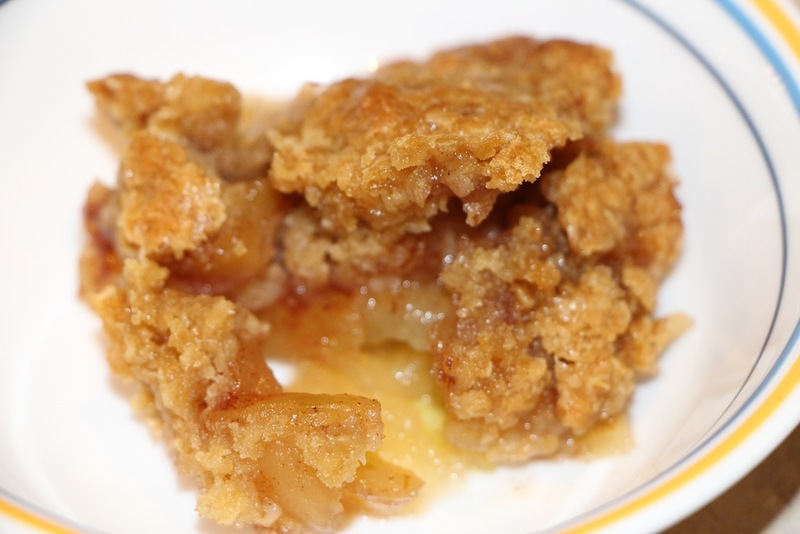 I’m going to share the recipes for applesauce and apple crisp with you. 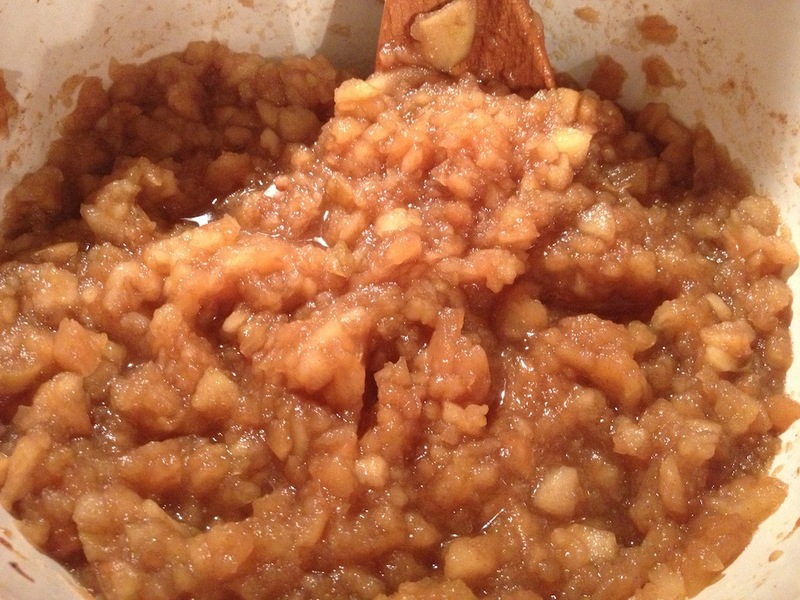 This was the first time I’ve made applesauce, but it was so easy! I made mine in the crockpot, because I think the crockpot is one of the best things in my kitchen. I’m not sure what size mine is, but it’s a fairly standard size. The great thing about this recipe is that you can very easily change it to whatever size you need. 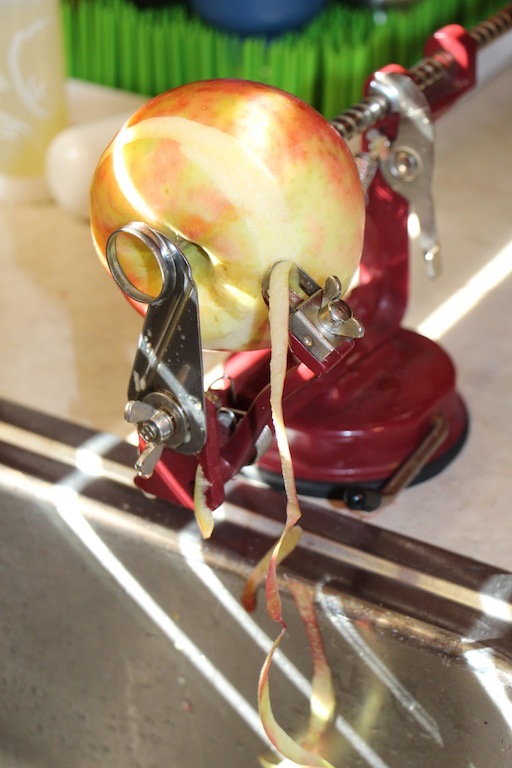 Using my handy dandy apple peeler/corer/slicer, I cut up 12 medium apples. Don’t worry if you don’t have one of these, just cut your apples up by hand. It doesn’t matter what your apple pieces look like, because they’re just going to cook down. It also won’t hurt if you accidentally get some peels in there, the applesauce will just get a little bit darker brown. 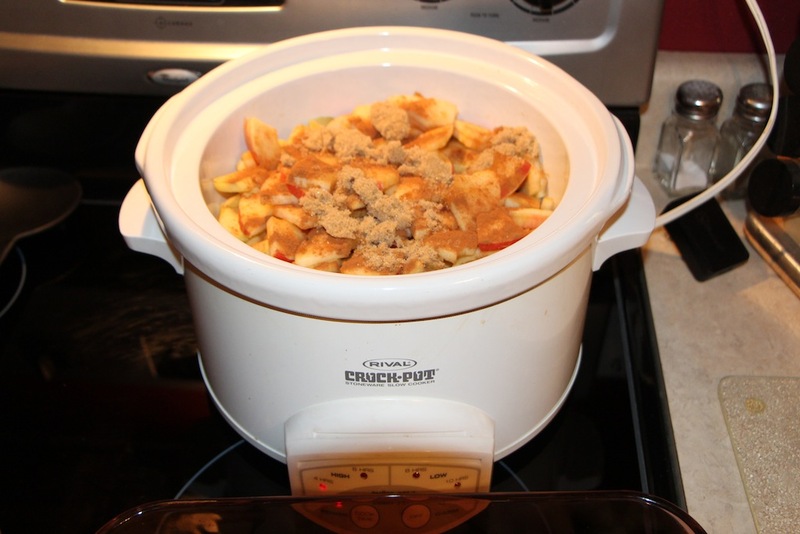 Put all the apples in your crockpot, and over the top, sprinkle on between ¼ and ½ a cup of brown sugar (white sugar can be used if you want). If your apples aren’t as naturally sweet, go closer to the ½ cup of sugar. Sprinkle on a good amount of cinnamon over the top and set the timer for about 4-5 hours on high (no stirring necessary!). When you can’t handle the smell anymore without eating some, open the lid and smash it up a little until you have the consistency you like. I used a potato masher, because we like ours chunky. If you like a smoother consistency, wait until the applesauce is cool and put it in your blender or food processor. My kids said this was the best applesauce they’ve ever eaten and they want to know when I’m making more! I did make one more batch while they were at school one day and froze it in smaller portions so we would have some left this winter. After we got done tasting the fresh applesauce, I had about 5 cups left for the fridge. Our absolute favorite fall treat is apple crisp. We got this recipe from my family’s church cookbook, so you know it’s going to be tried and true! We’ve been making this recipe for years and always make a double batch, because the original recipe only makes an 8×8 pan; a double can be made in a 9×13. The top gets very crispy and the apples get caramel-y and delicious. A winning combination! 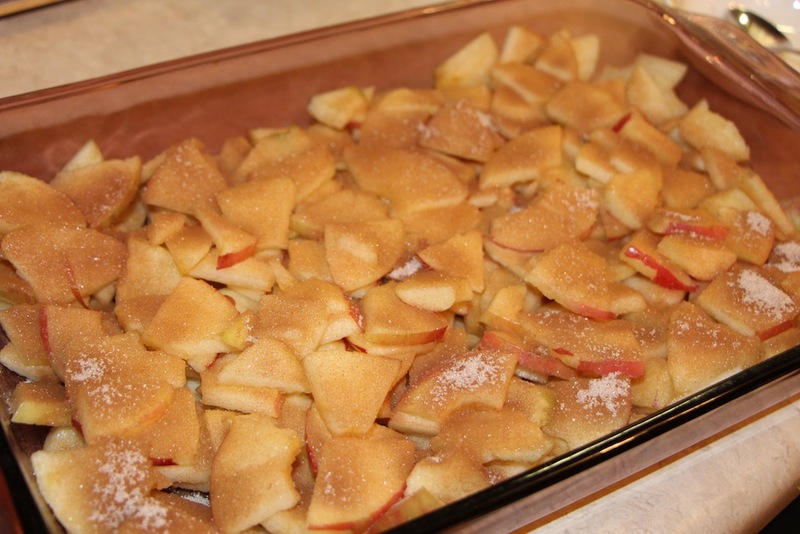 Fill 8×8 pan ½ full of apples, cover with white sugar and cinnamon. 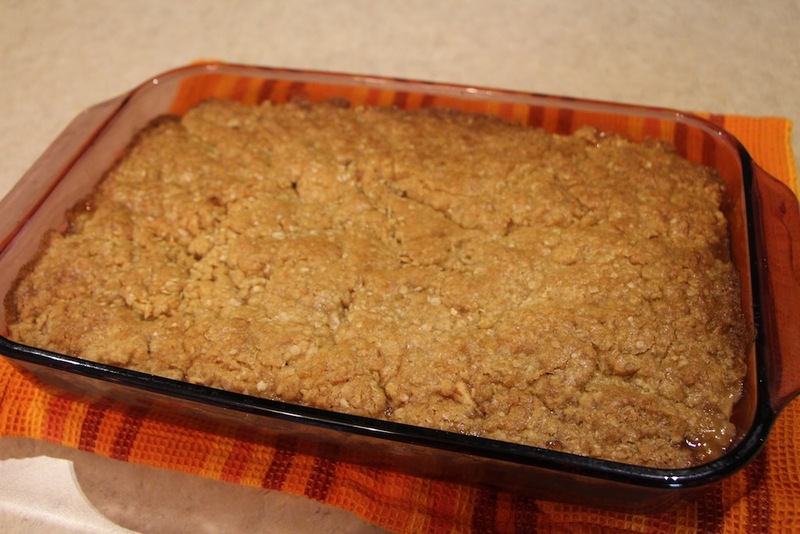 In a separate bowl, mix brown sugar, butter, oats and flour; press mixture down on top of apples. 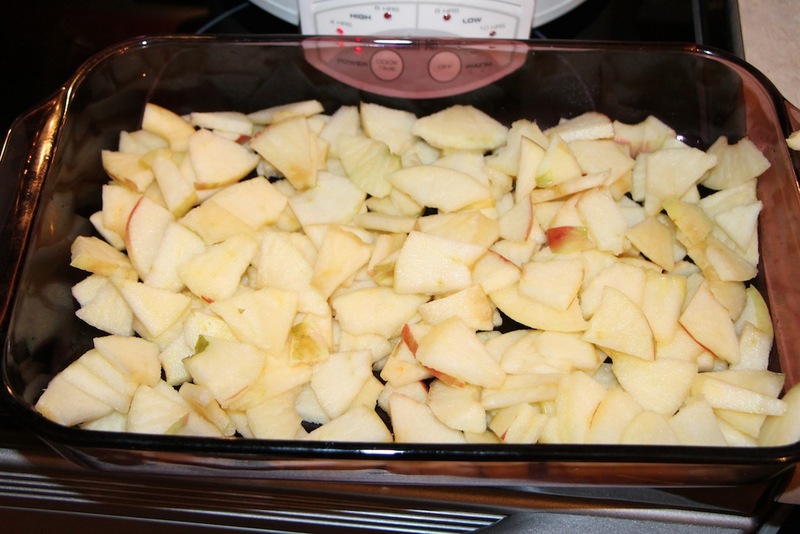 Bake at 350 until brown or until apples are fully cooked, about 45 minutes. What are your favorite fall recipes? Does your family have any fall traditions? Let us know in the comments below! This entry was posted in Eat Like a Local, Foodie Recipes and tagged apple chips, apple cider, apple cider donuts, apple cider slushie, Apple Crisp, Apple Crisp Recipe, apple picking, apple treats, apple turnovers, apple-picking season, apples, applesauce, Blushing Golden, Easy Apple Crisp Recipe, German apple cake, Homemade Applesauce Recipe, Honeycrisp, Iowa, Iowa City, Iowa City Iowa, Jonagold, mini apple pies, tractor ride, Wilson’s Orchard, Wilson’s Orchard Iowa City Iowa by Leah Zanolla. Bookmark the permalink.